Published in Scotland. Translated from the Swedish. Grump the Yule Tomte lives all alone, which is exactly how he likes it! He's waiting for Christmas to arrive when all of a sudden a gust of wind steals his mittens from the washing line and his hat from his head. That's the last straw -- he won't be the Yule Tomte any more!Binny and Barty, the rabbit children, live with their family in the forest. All the animals in the forest prepare for the arrival of Christmas. They make presents, bake sweet treats and even write a song. 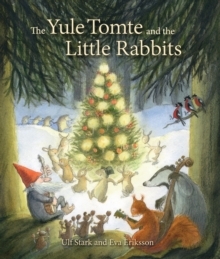 But will the Yule Tomte ever bring Christmas to the big forest?This charming and funny Christmas story of a grumpy tomte and the hopeful little rabbits is told over twenty-five chapters -- one for eachday of Advent -- with delightful festive illustrations. Perfect for families to share together.